Bladder infections such as cystitis are very common in cats. Symptoms include frequent urination, meowing whilst urinating and blood in the urine. Many cats suffer from urinary crystals, which can cause FLUTD and blockages in the urethra. 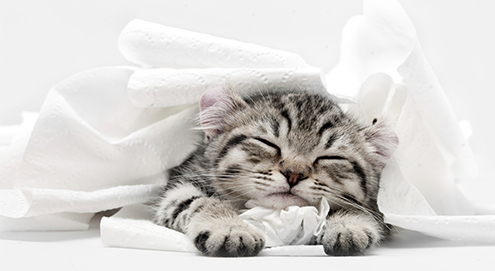 In this article, you can read all about the forms, causes and treatments of cystitis in cats. Although in humans, the term cystitis leads us to believe that it concerns a bacterial infection, this is rarely the case in cats. For cats under the age of 10, only 5% of cases are caused by a bacterial infection. We refer to cystitis in cats when your cat suffers with the following symptoms. It is important for the diagnosis and treatment of the condition to distinguish between feline cystitis with or without urinary crystals! Both male and female cats can contract cystitis. However, your cat may not have all of the above symptoms. If your male cat is UNABLE to urinate as a result of a blockage of the urethra, this is an emergency. It will cause the bladder to continue to fill up while your cat is unable to empty its bladder. This causes damage to the kidneys and may cause the bladder to rupture. Your cat will be lethargic, refusing to eat and may vomit. It will walk funny and suffer from severe abdominal pain. It will strain in the litter tray without producing a drop of urine. Your cat could die as a result of high renal values and cardiac arrhythmias due to a high potassium level. The blockage in the urethra (clump of urinary crystals, blood and/or mucous) must be removed as quickly as possible. Because male cats have a much narrower urethra than female cats, so this problem occurs mainly in males. If your cat's urethra is blocked, the veterinarian will usually attach a catheter and the cat needs to be hooked up to a drip and be admitted. The veterinarian will also check the renal values and potassium levels in the blood. Less common causes include bladder stones, polyps, congenital bladder conditions and bladder tumours. Painkillers that also function as an anti-inflammatory. Bladder relaxants (dridase, spasmoglucinol), because the bladder wall is often thickened and irritated and causes a higher urge to push. The veterinarian may even put your cat on a drip (under the skin or in the blood stream). Antibiotics is used if the infection is bacterial. Other measures: if your cat is overweight, it is important that it loses weight. Sometimes the veterinarian will prescribe stress-reducing medication and/or food supplements, such as: Feliway, Diazepam, Zylkène, Telizen, Royal Canin Calm Diet. Aside from all of the above measures, the urinary crystals must be dissolved. This can be done by feeding your cat a special diet. For example, in the event of Struvite crystals (most common), Hill's s/d Urinary Care - Prescription Diet – Feline, Royal Canin Urinary S/O and Royal Canin Urinary S/O (high dilution or Specific Struvite Dissolution/Crystal Prevention and Specific Crystal Prevention FCD/FCW can be given. This urinary cat food can dissolve existing Struvite crystals and prevents the formation of new crystals because it reduces the pH of the urine. Calcium-oxalate crystals are also common but unfortunately cannot be dissolved by diet food. The formation of new crystals can be prevented through the urinary cat food diet. Foods that are suitable for this include Royal Canin Renal, Hill’s U/D – Non Struvite or Specific Heart & Kidney Support. For a suitable dietary advice for your cat with bladder problems, you should contact our veterinarian directly. In the event of symptoms indicating cystitis, your veterinarian will usually want to examine a urine sample. You can collect urine at home through the use of special plastic pellets, Katkor. You put these pellets in the clean litter tray instead of cat litter, as they do not absorb urine. You can then collect the urine using a pipette or a syringe. It is important that you place the end of the pipette on the bottom of the litter tray when you collect the urine! Crystals are heavier than urine and therefore sink to the bottom. It is important for the urine to be as fresh as possible. You can keep the urine in the fridge for a maximum of 2 hours. Clean your litter tray daily and/or place an extra litter tray. Advice from cat behaviourists is as follows: The number of litter trays in the house = the number of cats in the house + 1. Once a cat has had urinary crystals, it is best to feed him a diet food for life, preventing the formation of new crystals. To collect urine sample for medical examination. For anxiety or stress in dogs & cats. For cats with urinary disorders. For anxious or frightened cats. Nutritional supplement for anxiety, stress/tension. For cats suffering from urinary tract conditions.